The Heart Failure GUIDELINES Pocket Guide is based on the latest guidelines of the American College of Cardiology Foundation (ACCF) and the American Heart Association (AHA) and was developed with their collaboration. 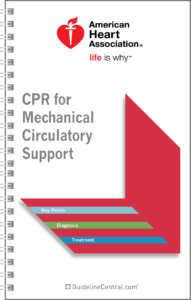 This practical quick-reference tool contains risk assessment and diagnostic recommendations, multiple diagnostic and treatment tables and algorithms, drug and interventional therapy guidelines, and patient follow-up recommendations. The clinical syndrome of heart failure (HF) may result from disorders of the pericardium, myocardium, endocardium, heart valves, or great vessels or from certain metabolic abnormalities, but most patients with HF have symptoms due to impaired left ventricular (LV) myocardial function. HF is a complex clinical syndrome that results from any structural or functional impairment of ventricular filling or ejection of blood. It should be emphasized that HF is not synonymous with either cardiomyopathy or LV dysfunction; these latter terms describe possible structural or functional reasons for the development of HF. HF may be associated with a wide spectrum of LV functional abnormalities, which may range from patients with normal LV size and preserved ejection fraction (EF) to those with severe dilatation and/or markedly reduced EF. In most patients, abnormalities of systolic and diastolic dysfunction coexist, irrespective of EF. The EF is considered important in classification of patients with HF because of differing patient demographics, comorbid conditions, prognosis, and response to therapies and because most clinical trials have selected patients based on EF. In view of the advances in medical therapy across the spectrum of cardiovascular diseases, the American College of Cardiology Foundation/American Heart Association (ACCF/AHA) guideline task force has designated the term “guideline-directed medical therapy” (GDMT) to represent optimal medical therapy—a combination of lifestyle modifications and medications—as defined by their guideline-directed therapies (primarily Class I)(see Figure 1). This guideline outlines a comprehensive approach to the management of HF by ACCF/AHA stage of HF development (see algorithmic summary in Figure 3). The definition of HFrEF has been variable, but to date efficacious therapies have been demonstrated only in patients with an EF of ≤35% or ≤40%. Approximately half of patients with HFrEF may also have variable degrees of LV enlargement. Although coronary artery disease (CAD) with antecedent myocardial infarction (MI) is a major cause of HFrEF, many other risk factors may lead to LV enlargement and HFrEF. In patients with clinical HF, studies estimate that the prevalence of HFpEF ranges from 40% to 71% because the EF cutoff has varied between >40% and ≥55%. Evidence of abnormal LV diastolic dysfunction that can be determined by Doppler echocardiography or cardiac catheterization. I. Heart failure with reduced ejection fraction (HFrEF) ≤40% Also referred to as “systolic HF.” Randomized clinical trials have mainly enrolled patients with HFrEF, and it is only in these patients that efficacious therapies have been demonstrated to date. II. Heart failure with preserved ejection fraction (HFpEF) ≥50% Also referred to as “diastolic HF.” Several different criteria have been used to further define HFpEF. The diagnosis of HFpEF is challenging because it is largely one of excluding other potential noncardiac causes of symptoms suggestive of HF. To date, efficacious therapies have not been identified. IIa. HFpEF, borderline 41%–49% These patients fall into a borderline or intermediate group. Their characteristics, treatment patterns, and outcomes appear similar to those of patients with HFpEF. IIb. HFpEF, improved >40% It has been recognized that a subset of patients with HFpEF previously had HFrEF. These patients with improvement or recovery in EF may be clinically distinct from those with persistently preserved or reduced EF. Further research is needed to better characterize these patients. No limitation of physical activity. Ordinary physical activity does not cause symptoms of HF. Slight limitation of physical activity. Comfortable at rest, but ordinary physical activity results in symptoms of HF. Marked limitation of physical activity. Comfortable at rest, but less than ordinary activity causes symptoms of HF. Unable to carry on any physical activity without symptoms of HF, or symptoms of HF at rest. Potential clues suggesting etiology of HF A careful family history may identify an underlying familial cardiomyopathy in patients with idiopathic DCM. Other etiologies should be considered as well. Duration of illness A patient with recent-onset systolic HF may recover over time. Severity and triggers of dyspnea and fatigue, presence of chest pain, exercise capacity, physical activity, sexual activity To determine NYHA class, identify potential symptoms of coronary ischemia. Anorexia and early satiety, weight loss Gastrointestinal symptoms are common in patients with HF. Cardiac cachexia is associated with adverse prognosis. Weight gain Rapid weight gain suggests volume overload. Palpitations, (pre)syncope, ICD shocks Palpitations may be indications of paroxysmal AF or ventricular tachycardia. ICD shocks are associated with adverse prognosis. Symptoms suggesting transient ischemic attack or thromboembolism Affects consideration of the need for anticoagulation. Development of peripheral edema or ascites Suggests volume overload. Disordered breathing at night, sleep problems Treatment for sleep apnea may improve cardiac function and decrease pulmonary hypertension. Recent or frequent prior hospitalizations for HF Associated with adverse prognosis. History of discontinuation of medications for HF Determine whether lack of GDMT in patients with HFrEF reflects intolerance, an adverse event, or perceived contraindication to use. Withdrawal of these medications has been associated with adverse prognosis. Medications that may exacerbate HF Removal of such medications may represent a therapeutic opportunity. Diet Awareness and restriction of sodium and fluid intake should be assessed. Adherence to medical regimen Access to medications; family support; access to follow-up; cultural sensitivity. BMI and evidence of weight loss Obesity may be a contributing cause of HF; cachexia may correspond with poor prognosis. Blood pressure (supine and upright) Assess for hypertension or hypotension. Width of pulse pressure may reflect adequacy of cardiac output. Response of blood pressure to Valsalva maneuver may reflect LV filling pressures. Pulse Manual palpation will reveal strength and regularity of pulse rate. Examination for orthostatic changes in blood pressure and heart rate Consistent with volume depletion or excess vasodilation from medications. Jugular venous pressure at rest and following abdominal compression (http://wn.com/Jugular_Venous_Distension_Example) Most useful finding on physical examination to identify congestion. Presence of extra heart sounds and murmurs S3 is associated with adverse prognosis in HFrEF. Murmurs may be suggestive of valvular heart disease. Size and location of point of maximal impulse Enlarged and displaced point of maximal impulse suggests ventricular enlargement. Presence of RV heave Suggests significant RV dysfunction and/or pulmonary hypertension. Pulmonary status: respiratory rate, rales, pleural effusion In advanced chronic HF, rales are often absent despite major pulmonary congestion. Hepatomegaly and/or ascites Usually markers of volume overload. Peripheral edema Many patients, particularly those who are young, may not be edematous despite intravascular volume overload. In obese patients and elderly patients, edema may reflect peripheral rather than cardiac causes. Temperature of lower extremities Cool lower extremities may reflect inadequate cardiac output. CHARM risk score Pocock SJ, et al. Eur Heart J. 2006;27:65-75. CORONA risk score Wedel H, et al. Eur J Heart Fail. 2009;11:281-291. I-PRESERVE score Komajda M, et al. Circ Heart Fail. 2011;4:27-35. ADHERE classification and regression tree (CART) model Fonarow GC, et al. JAMA. 2005;293:572-580. ESCAPE risk model and discharge score O'Connor CM, et al. J Am Coll Cardiol. 2010;55:872-878. OPTIMIZE-HF risk-prediction nomogram Kociol RD, Horton JR, Fonarow GC, et al. Circ Heart Fail. 2011;4:628-636. For patients at risk of developing HF, natriuretic peptide biomarker–based screening followed by team-based care, including a cardiovascular specialist optimizing GDMT, can be useful to prevent the development of left ventricular dysfunction (systolic or diastolic) or new-onset HF. In patients presenting with dyspnea, measurement of natriuretic peptide biomarkers is useful to support a diagnosis or exclusion of HF. Measurement of BNP or NT-proBNP is useful for establishing prognosis or disease severity in chronic HF. Measurement of baseline levels of natriuretic peptide biomarkers and/or cardiac troponin on admission to the hospital is useful to establish a prognosis in acutely decompensated HF. During a HF hospitalization, a predischarge natriuretic peptide level can be useful to establish a postdischarge prognosis. In patients with chronic HF, measurement of other clinically available tests, such as biomarkers of myocardial injury or fibrosis, may be considered for additive risk stratification. 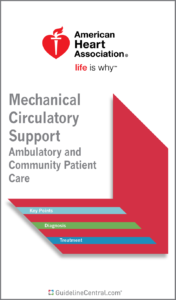 Who may need consideration for mechanical circulatory support (MCS) or transplantation.